This manual is part reference and part tutorial, meaning that you can look to it for everything from the simple questions of , “What does this icon do?” to the more involved questions, like “How do I schedule e-mail notifications?” Your experience with Restore will depend on your privileges on the Restore system. The administrator for the system will have a few extra capabilities that a standard user will not. We have tried to accommodate all levels of users in this manual, providing information pertinent to both users and administrators, novice computer users and advanced users. Each chapter contains a brief overview and a list of the chapter sections. Each chapter section will contain a summary that will tell you why you would need to know this information or what you would gain from the instructions in that section. 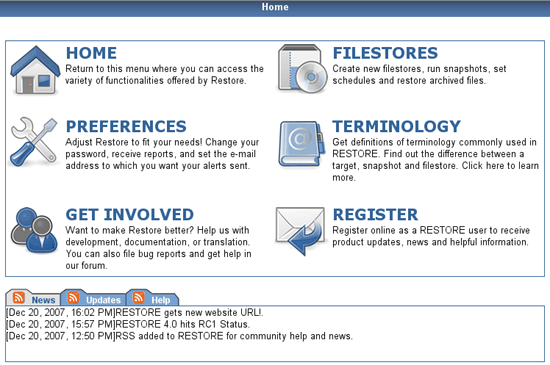 In each chapter section there are steps that walk you through the process accompanied by examples or screen shots to help you visualize the process of using Restore. Some complex concepts will occupy several sections, using the first section to explain basic functions and other sections to explain concept applications. These chapters will note that users who feel comfortable with the basic functions can skip ahead. You can read this book from cover to cover or jump around, using it to answer your specific questions. Don't forget to consult the table of contents, glossary, and index for specific questions! Good luck! The RESTORE system offers incredible control over the backup and restoration of your data. With a large number of tools available to manage your backups all available with just a few mouse clicks, we'll take a look at how to get started in the RESTORE system. Open a Web browser on your computer. Into the location bar, type the address of your RESTORE server as provided by your administrator. The Restore browser URL is http://ip_of_server/restore (e.g., http://192.168.10.10/restore). 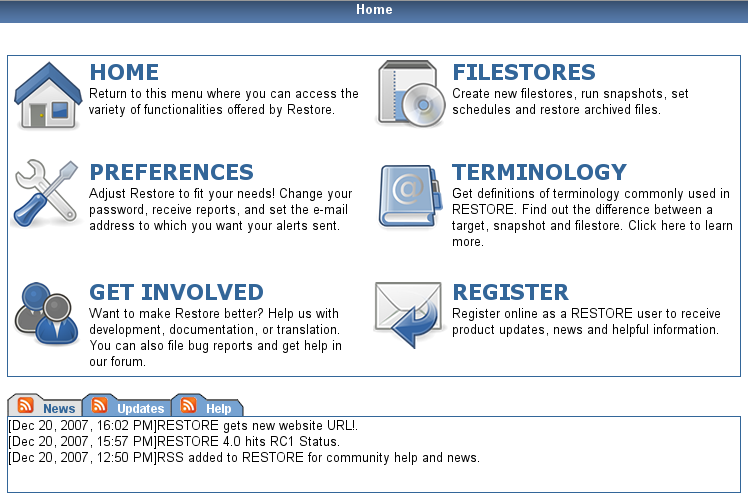 Home - Return to this menu where you can access the variety of functionalities offered by Restore. 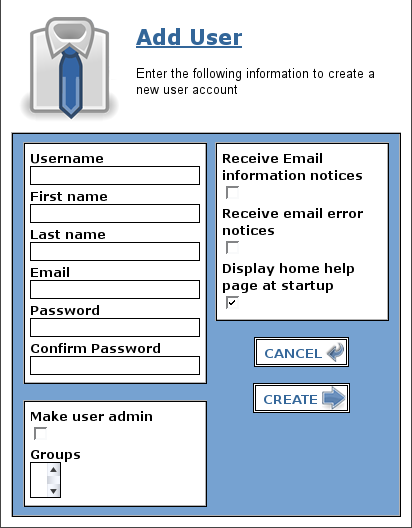 Preferences - Change your password, receive reports, and set the e-mail address to which you want your alerts sent. Get Involved - Help with Development, documentation, or translation. You can also file bug reports and get help in our forum. Filestores - Create new filestores, run snapshots, set schedules and restore archived files. RSS Feeds - Stay up to date with the latest news, updates, and help manuals. Clicking these Icons will take you to the section selected. Alternatively, you have the option for this page not to be displayed upon successful login on the user preferences setup. We will discuss this in a later chapter. Along the top of the screen, you will find the Restore toolbar (Figure 3). Upon successful login, this will always be at the top of your page for easy access to your destination. - The Home button will take you back to the main "Home Screen" as discussed in 1.2. - The Filestores button will direct you to the page where you can manage or create new filestores. - The Preferences button will allow you to change your settings for your Restore account. This includes changing your password, setting your email address, and notice options. - The Get Involved button will take you to the Restore website where you can help with development, documentation, or translation, file bug reports and get help in our forum. - The Logout button logs you out of the Restore System. Note: Some of these options will be discussed in greater detail in the following chapters. This chapter is intended only for people who will be acting as the Administrator of the RESTORE system. As the Administrator, you begin as the only user on the RESTORE system, and it is up to you to handle the creation of any system users and groups. As the RESTORE Administrator you have the ability to act as and become any user in the system. This chapter will take you through the creation and management of users and groups as well as how to control and manage your RESTORE system. As the Administrator, you have a few special abilities that other RESTORE users will not have and will have a slightly different layout. After logging in, the Administration Dashboard only has access to one additional section of the system (''Admin''), this page makes a big difference. The ''Admin'' window gives you the ability to create Users and Groups, giving them the ability to manage their own backups while keeping everyone's data safe. You will notice in figure 1 the Admin button along the top toolbar. This will be very similar to what a non-admin user sees, except for one key difference, the "Admin" button. As the Administrator, you have absolute power over all Filestores on your system, able to start, stop, edit, or even remove them without permission from the owner of the Filestore. We will discuss the concepts of permissions and ownership later on. On the toolbar, click the "Admin" button and you will come to a screen (figure 1 above) where you can add a user. By default, admin is the only user in the system. 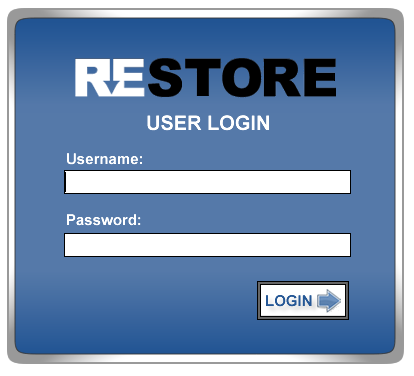 To create a new Restore User, click on the "Add User" button on the right of the screen. This will bring up a box (figure 2) where you will put in the new users credentials. You will need to assign the User a User Name and Password. User Name may include letters, numbers, underscores, and dashes. Passwords may contain letters, numbers, and punctuation. Along with the new users username, you can supply a first and last name and email address and check the according boxes to receive email alerts about your backups. You have the ability to add this user as an admin. Also, if you have groups created, you may add your new user to a group here. Once that is done, click "Create" and you will be brought back to the Users List shown in Figure 1 and your new user will appear. Certainly the creator of a Filestore needs to have the ability to backup, restore, and configure it, but what if you have multiple users you would like to be able to use one Filestore? This is why Restore uses groups to manage permissions. By granting a group ownership of a Filestore, you can allow all the users in that group the ability to manage its contents. To Create a group, click on the "Admin" button across the top toolbar then click on the "Groups" Tab. This will bring you to a page such as Figure 3. You will notice at first there are no groups on the system. 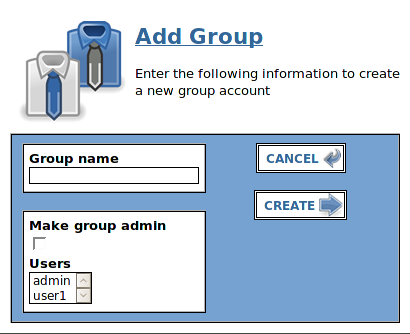 To Create a group, click on the "Add Group" button on the right which will bring up a screen (Figure 4). Here you can enter the name you want the group to have. You will aslo notice that it lists all the current users you have created. You may add these users to your group here (In order to select multiple users, hold the Ctrl key down while selecting users). You may also make it the "admin" group which will have full administrative privileges on the filestores. Now that you have created your groups, you are able to administer permissions on Filestores when you are ready to do so. We will discuss the permission in a later chapter. Restore allows you to modify different settings for both users and groups. As the administrator, you my edit a users preferences, delete a user, change a users group, or delete a group. In order to do any of those, you can click on the "Admin" button along the top toolbar. Once you are to the users/groups page (Figure 1 above), you can either click on the user or group to edit its preferences.